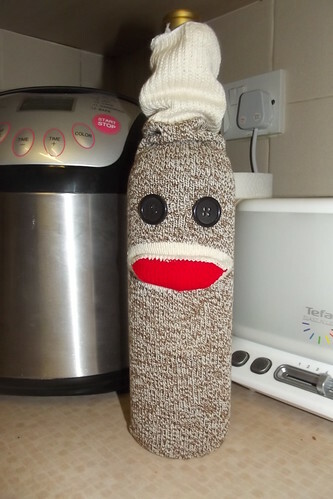 I have had a long-standing love affair with sock monkeys. 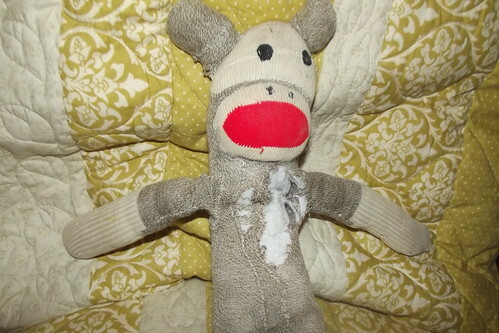 My first sock monkey was 'acquired' when I was very small (read the story here! ), and I have loved them ever since. When Fifi was still just a wish and a prayer, I dreamed of decorating a nursery sock monkey style - curtains, bedding, little sock monkey toys everywhere... but it never happened and that was that. But being in America over Christmas reignited my sock monkey flame, and the wheels in my head have been turning ever since. I suddenly got the idea to have a sock monkey cake for my birthday party (and if I were only turning 2 I'd get all the sock monkey party supplies available on the web!). Then it hit me - decorate the new baby's room with sock monkeys! Now really the new baby's room will just be Fifi and Lolly's room, so I'd really just be redecorating their room, but the new baby in and of itself is motivation enough to start dreaming. I found some lovely fabric in which to make a duvet cover, pillow shams and some decorative bunting for the room, and some giant wall stickers for decorating the wall. The carpet in there is already sock monkey brown, so I could paint one wall red, leave the rest off-white, and it would be perfect! 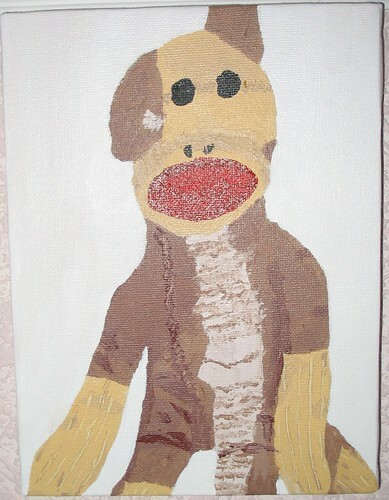 I would eventually hang some sock monkey-inspired curtains... collect more sock monkey paraphernalia... ahh the possibilities! It's a big idea that will not be cheap, but I love it. And I hope it's a theme that they wouldn't grow out of until about pre-teen age. You know, as long as I keep it trendy. Unlike the rainbow-and-cloud wall paper my parents hung in my room that was adorable when I was a toddler, but mortifying when I was in Junior High. I mean, that was the same wall paper that hung in our church's baby room! And if not, well, at least a red accent wall won't age, and the wall stickers peel right back off. 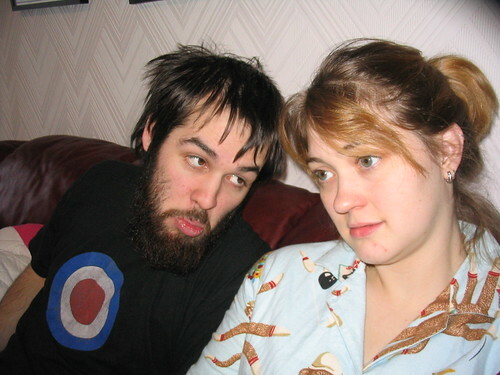 I threw in this 'vintage' shot of me and Scott back in '05 for funsies. 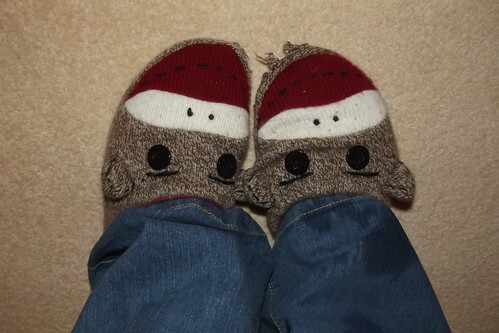 A) Because I am wearing my sock monkey pajamas. B) Because Scott's beard is terrifying. 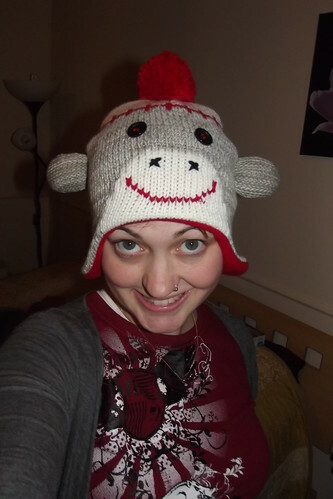 **Many thanks to Mom, Matt, Charity and Amanda for all the sock monkey stuff they have lavished on me through the years.